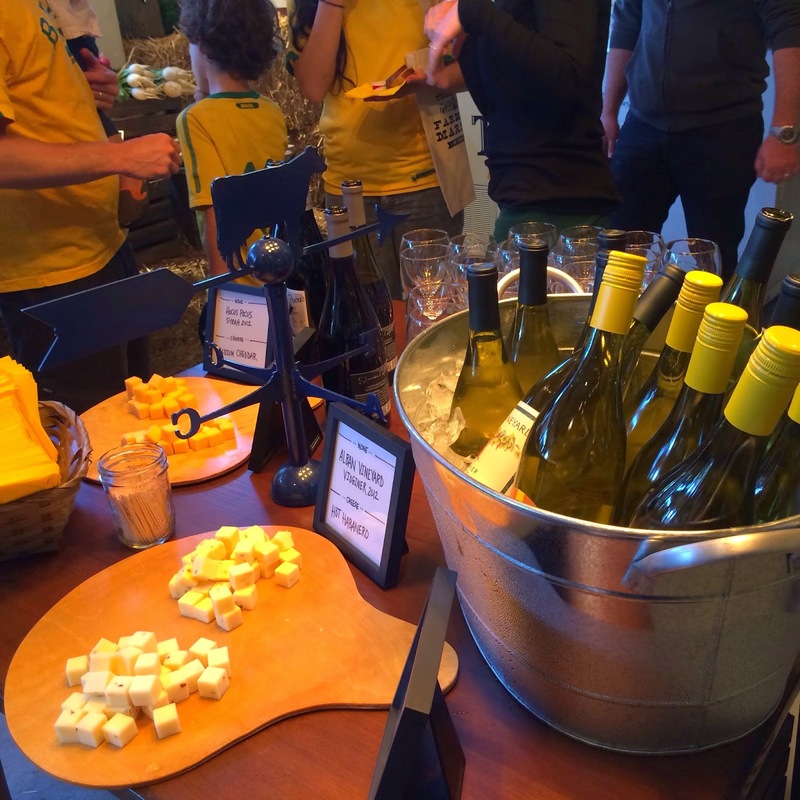 Last week, the good folks at Tillamook invited me to a farmer's-market-style launch party to introduce their newest products. Since I was already a huge fan of their ice cream, I of course said yes. Plus, it would work out perfectly since we already planned to be in the city that morning to go to the San Francisco zoo. It made total sense right? Two adults, two babies, two back-to-back events. It was a bit crazy but we were feeling lucky. Or crazy. After a full day at the zoo, it was time to hit up the pop-up farmer's market and both Little Man and Little Lady were minutes away from total meltdown. So we did what any sane parents would do. Placated Little Man with a lollipop, popped Little Lady in her Ergo, and made a mental pact to bolt from the event at the first sign of either kid truly losing it. That grin on my face? It's the grin of a crazed woman operating on borrowed time. Who was attempting to strike a pose. Unsuccessfully, I might add. Awk. Ward. As soon as we got to the event and were welcomed by the Tillamook mobiles, it immediately felt different from a regular media event. First off, there was valet parking. In San Francisco, a city with notoriously little street parking? And on a day where we were lugging both babies? Um, yes please! Second, families were invited. Now, I'm all for kids obvs but I also know they're not exactly predictable or well, quiet. So thanks to Tillamook for willingly putting up with our babies. Let me know when you want to babysit! Third? The folks at Tillamook are fantastic! It's clear they're genuinely passionate from the way they chat about their products. The Hubster and I were blown away as we sampled delicious treats made using Tillamook products, chowed down on fancy grilled cheese sandwiches made by the friendly folks at The American Grilled Cheese Kitchen, and ate our weight in ice cream on delicious homemade waffle cones. Oh, and if all of that wasn't enough, they had built a refrigerated wall of cheese. I swear, it was cheese as far as the eye could see. Everything from sliced to shredded to blocks. Ten kinds of cheddar? Yup. Spicy pepper jack? Mmm hmm. Perfectly creamy swiss? Of course. And the best part about the farmer's market? Everyone was given a bag to "shop" the market. You could take home anything you wanted! The food blogger in me knew I should at least try to choose new items but the ice cream fiend in me seriously contemplated walking out with as many tubs of ice cream as my grubby little paws could carry. If I had Little Man's wagon with me, I would've loaded it with ice cream tubs and rolled on out of there because I have zero shame when it comes to ice cream. Zero. Thankfully, the Hubster was there to reign in my crazy, and we picked a good range of old favorites and new products like the 3 Year Vintage Extra Sharp White Cheddar. Now, I'm not one to believe a cheese can be vintage. Cheese is cheese is cheese, right? Except this one. Holy moly! It's crumbly like parm but sharp like the sharpest cheddar. And the dessert yogurt? I don't know how those yogurt elves did it but the Marionberry Cobbler seriously tastes like cobbler in yogurt form. Now I would've been perfectly content to just eat all the treats straight up but I figured I needed to do something nice for the Hubster for helping wrangle two babies while I stuffed my face at the event. So I used Tillamook's Premium sour cream to bake that beautiful man a batch of Dark Chocolate Sour Cream Muffins. 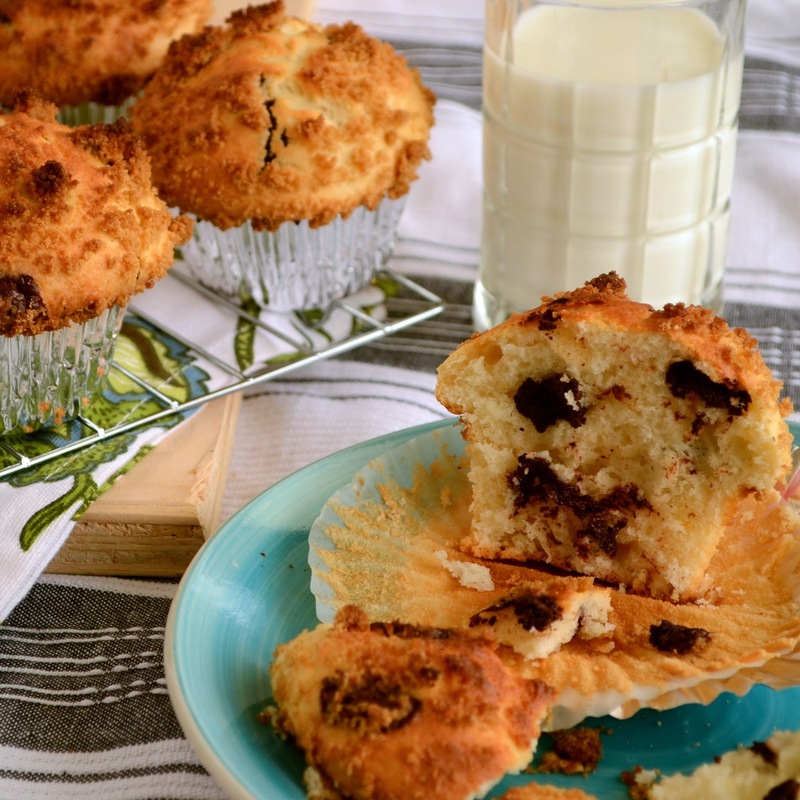 It sounds a bit strange but the sour cream is the perfect addition for keeping the muffins moist. And the muffins are totally versatile. Feel free to swap in your favorite berries instead of or in addition to the chocolate! And as a side note, this must be the most forgiving muffin recipe ever. I baked the muffins with Little Man's "help" so our measurements were approximate at best and the muffins still came out great. As for me, I'll be hiding out in the kitchen eating all the remaining ice cream and cheese samples. Preheat the oven to 375°. In a medium bowl, combine the brown sugar, flour, and butter. Rub with your fingers to form coarse crumbs. Refrigerate until ready to use. In a medium bowl, whisk the 1 1/2 cups of flour with the baking powder, baking soda and salt. In a large bowl, using a handheld mixer, beat the egg at medium speed until frothy. Add the sugar and melted butter and beat until pale yellow, 1 minute. Beat in the sour cream until blended. Add the dry ingredients and beat at low speed until almost blended. Using a rubber spatula, fold the chocolate chips into the batter. Fill muffin cups to the top with batter and sprinkle with the topping. * Bake for 25 minutes, or until a cake tester inserted in the center of a muffin comes out clean. Remove the muffins from the pan and let cool on a rack. *Note the original recipe yields 12 muffins but I wanted giant muffins so I filled each cup to the brim and got 8 muffins. seems like you guys had a blast here - this place is a true foodie heaven. OMgosh you are so brave. Been a while since I visited and didn't know you had a new little girl - congrats! With my first, who is 6 months old, I don't know if I could have pulled it off. You did great! Score on the cheese, yogurt, and sour cream! The muffins look fabulous. I love using sour cream in baked goods! You look amazing and so happy! And that sharp cheddar sounds like a dream come true...mmm! And these muffins - definitely need to make them soon. Oh wow! The zoo looks like fun. Farmer's market are always great to walk around and find things!! These muffins look amazing indeed. Woah wow! Now that's an event not to miss! What fun to "shop" that way. You look great and your husband definitely deserved these muffins. Just the name alone....I know it's good! Oh you are looking gorgeous, lady..and I envy not all the cheese, but those muffins! They look scrumptious, and always in for a good dose of chocs! That sounds like a really fun event. And the wall of cheese. And cobbler yogurt?!?! I would just die! I *heart* cheese and yogurt so much. The muffins also sound delicious! Back when I was able to eat cheese - pre-Maya (I blame her for my lactose intolerance!) - Tillamook was my favorite. Haha - I could hardly contain my chuckling at "That grin on my face? It's the grin of a crazed woman operating on borrowed time" - I so know what you mean! These muffins look so good! I take Lucy in my ergo everywhere. It has been a lifesaver. Thank you for sharing your adventures at Tillamook! The cheese looked heavenly and you look gorgeous! What an awesome event! We just moved to the land of Tillamook so I totally relate when you say you want to run out with tubs of ice cream (the best ice cream in the world). And a wall of cheese, seriously. What a wonderful pic of you and Little Lady!